This is a problem. Trade advocates argue that letting the TPP die would be a significant lost opportunity for the global economy. But there’s a potentially bigger problem here – one that may have serious consequences for both U.S. national security and regional stability in the Asia-Pacific. Just consider the strategic backdrop against which last month’s negotiations occurred. Maritime disputes flaring across the South China Sea. Tensions rising between Beijing and Tokyo. Perennial friction between China and Taiwan and a growing nuclear stockpile in North Korea. If the TPP falls through, it could greatly hurt the America’s ability to stabilize the fraught geopolitics of Asia. 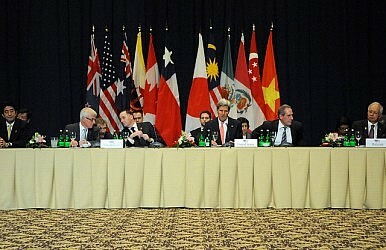 Some have argued that a TPP failure would be a net positive for regional stability. The deal, they claim, would isolate and provoke China, and should therefore be abandoned. But this view is blinkered. In fact, there are a number of reasons to believe that the opposite is true: that a TPP failure will cause a number of strategic problems for the U.S. in the Asia-Pacific. First, failure would mean stunting the growth of America’s Pacific partners. This is problematic for two reasons. Most importantly, fewer states would be devoting fewer resources to meet shared challenges like counterterrorism and climate change. In addition, as countries get richer and more interdependent, they become more invested in the well-being of their neighbors. And while free trade, interdependence, and prosperity do not guarantee stability and peace (see: World War I), they do create conditions that make conflict less appealing. Second, failure would create more potential for instability and crises. Consider a hypothetical scenario in which China and one of its neighbors along the South China Sea (say, Vietnam) get into a serious spat over territorial claims. With the TPP, this spat would be less likely to escalate into a full-blown crisis, as China understands that the U.S. is more inclined to intervene in situations that threaten its growing trade interests. Without the TPP, there is less clarity about U.S. resolve, so the potential for miscalculation and escalation increases. Third, failure would send a strong signal that the U.S. no longer has the political will to lead in the region. This would come at a time when allies are already uncertain of U.S. commitments. Earlier this week, for example, Japan’s trade minister expressed disappointment in last month’s trade meetings, saying “every TPP country wondered why the U.S. was quick to give up the conclusion without its usual relentless persistence.” If the U.S. allows negotiations to collapse, it would demonstrate the Obama administration’s declaration – that the U.S. is “all in, when it comes to the Asia-Pacific” – to be hollow. This has important geopolitical implications. If Asia’s great powers perceive the U.S. to be unserious about its role in the region, this will increase the incentive for the powerful regional states (i.e. China and Japan) to jockey with one another for regional hegemony. Finally, failure would be a missed opportunity for the U.S. economy – and America’s ability to project strength abroad rests on its economic foundation at home. According to an analysis from the Peterson Institute, U.S. income gains under the TPP would be significant, potentially adding $59 billion per year by 2020. Failing to conclude the TPP would forego these potential gains, and would make it more difficult for the U.S. to stem the defense cuts put in place by the sequester and invest in our military presence in the Asia-Pacific. The Nobel Prize winning economist Thomas Schelling noted that “trade is what most of international relations are about. For that reason trade policy is national security policy.” Today, U.S. trade policy – and indeed, its national security policy – are in danger of falling apart. Getting something as big and complicated as the TPP across the line won’t be easy. But given the smoldering flashpoints across Asia, the U.S. can hardly afford to squander any tools in its foreign policy toolkit. The stakes are too high.